As daylight hours decrease and temperatures start to cool down, we’re more susceptible to seasonal affective disorder (SAD), a form of depression related to a change in seasons. Its main cause is that change in light, which affects our levels of melatonin and circadian rhythm (sleep cycle) as well as our levels of mood-regulating neurotransmitter serotonin. These changes can also affect levels of stress hormone cortisol. Don’t cut all the carbs. Sweet potatoes also provide antioxidants vitamins A and C and beta-carotene. They’re also packed with potassium, a key nutrient for muscle and nerve function and stress response. Oats provide slow-burning complex carbs as well as tryptophan and vitamin B6, both of which are also key to serotonin production. Beans, peas, and lentils are packed with fiber and plant protein to help keep you satisfied and manage cravings. Bananas are another complex-carb source that also contains tryptophan, vitamin B6, and potassium. You may associate this amino acid with falling asleep on the couch after Thanksgiving turkey, but in actuality, tryptophan is found in animal proteins like poultry, meat, and fish as well as in some plant-based sources like legumes, bananas, and oats. A precursor to serotonin, tryptophan is another essential part of serotonin production. Work in folate-rich foods to boost dopamine. Dopamine is a neurotransmitter that helps regulate our brain’s reward and pleasure centers and plays a big role in mood. The folate in foods like beans, leafy greens, oranges, and avocados help support efficient production of dopamine. Stay on top of your vitamin D.
In the darker months, it’s key to get enough vitamin D since our body synthesizes vitamin D via sunlight exposure. We’re more likely to feel bummed out and foggy when we’re deficient. Find it in fatty fish, eggs, milk (the U.S. dairy supply is fortified), or consider a supplement. Consuming adequate omega-3 fatty acids is helpful for mitigating the effects of stress hormone cortisol. A few good sources: fatty fish like salmon, sardines, and mackerel; grass-fed beef; walnuts; and flax and chia seeds. Populate the GI tract with probiotic bacteria. 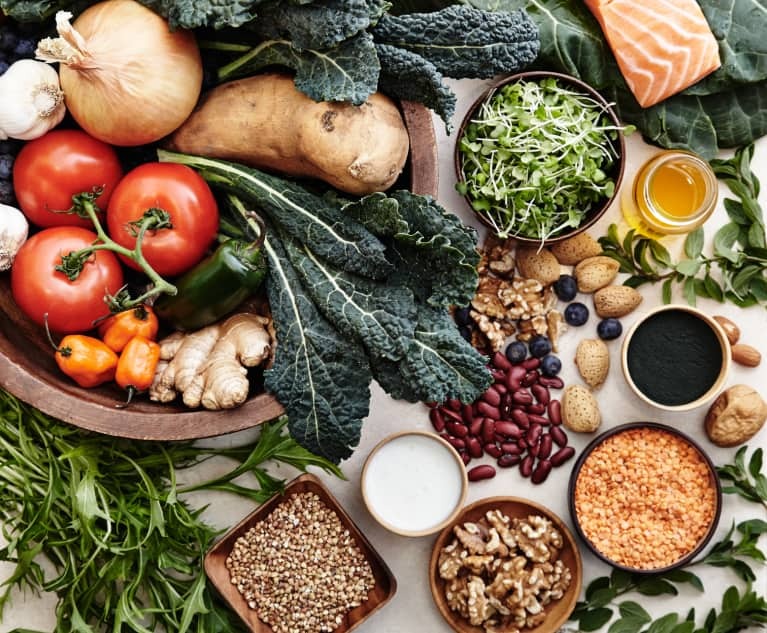 Because so much neurotransmitter production occurs in the gut (not to mention immune system function), nourishing the health of the digestive tract is key to overall wellness. Beneficial probiotic bacteria found in foods like yogurt, kefir, kimchi, miso, sauerkraut, kombucha tea, and other fermented foods are great sources to include as a regular part of your diet. Aside from fat promoting satiety, consuming enough fat is essential for healthy body and brain function. It also helps the body absorb nutrients like fat-soluble vitamins A and D. Reach for olive oil, avocado, nuts, and seeds as your go-to’s, but don’t shy away from egg yolks—there’s lots of good stuff in there. Yes, you can eat chocolate. Dark chocolate is packed with powerful compounds called flavonols, which have been studied for their neuroprotective effects and ability to improve mood, among other benefits. Just be mindful of portions, and make sure to account for it in the context of your day—studies have shown that about an ounce per day is all you need to reap the benefits. File this one under “good carbs.” This savory breakfast provides a balancing combo of protein, fat, and complex carb that also boasts omega-3 fatty acids, vitamin D, and potassium. On stovetop, bring water to a boil in a small saucepan. Lower heat and add oats, flax, and spices. Cook until almost all liquid is absorbed. Meanwhile, cook egg as preferred (such as poached or fried). Pour oats into a bowl and top with egg and avocado. Variations: Feel free to add extra veggies in or on top of the oats or cook the eggs in rather than adding on top if preferred. This salad is packed with plant-protein and filling fiber as well as tryptophan and folate. This is one that will actually keep you satisfied and energized. Toss chickpeas and spices with olive oil and place on another baking sheet. Roast about 20 minutes, shaking a few times to prevent sticking. With a whisk, combine miso paste, tahini, apple cider vinegar, water, and nutritional yeast. Add more water if desired to thin out. With clean hands, massage dressing into salad until kale begins to soften. Add hemp hearts and sun-dried tomatoes into salad. Add cooked squash and chickpeas and toss well. This super-easy sheet pan dinner is a delicious way to work some omega-3 fatty acids, vitamin D, potassium, and folate into your day. Whisk together 1 tablespoon olive oil with soy sauce, maple syrup, and water to make a light sauce. Place with salmon in an airtight sealed container or plastic bag. Set aside. Toss broccoli and sweet potato with remaining olive oil. Spread on baking sheet. Bake 15 to 20 minutes. Make space on the baking sheet for the salmon and place it on the sheet, skin side down. Bake another 10 to 12 minutes or until salmon is opaque in the middle. This quick and easy snack is packed with protein—it even does double duty as an on-the-go breakfast option. Stir cinnamon and chia seeds into yogurt. 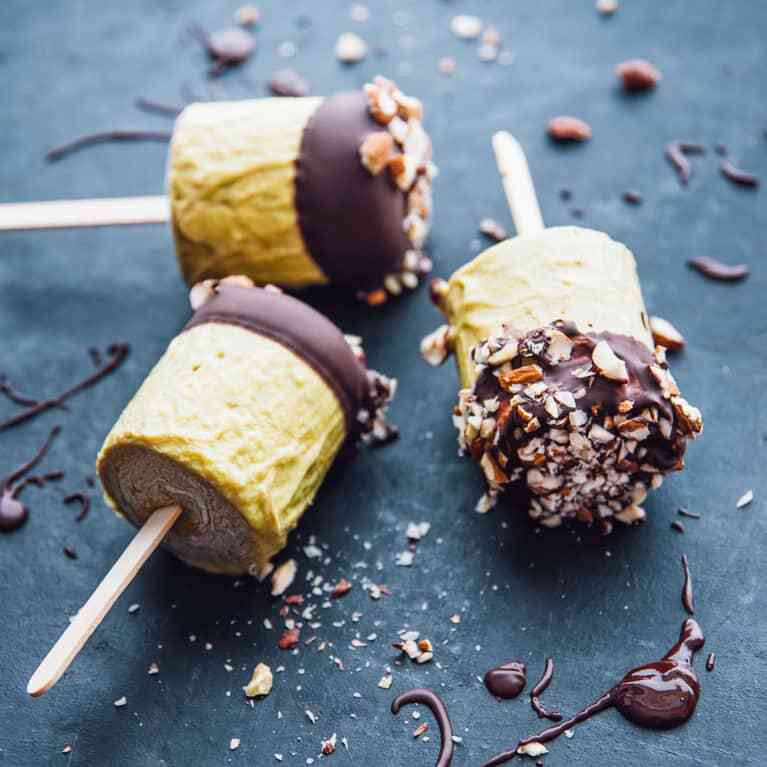 This delicious snack tastes like a decadent dessert and boasts the SAD-fighting benefits of tryptophan, vitamin B6, complex carbs, and antioxidants. Peel banana and slice into small rounds and arrange in a circle along the edge of a plate. Melt chocolate in a small ramekin or glass bowl in the microwave or over a double boiler on the stove. Place the ramekin or bowl of melted chocolate in the middle of the plate with the banana slices. Use a fork or skewer to dip the banana slices into the chocolate. If preferred, you can drizzle the chocolate over the banana instead. Psst—make sure you’re incorporating these three mood-boosting foods into your daily diet as well! Thanks for sharing some great information.